Helpful leaflets for parents and carers – 3 new numeracy leaflets now available! 1st March 2016 - Helpful leaflets for parents and carers – 3 new numeracy leaflets now available! Many parents of struggling learners are keen to know how they can help their child further with their reading or numeracy skills, so that’s why we’ve produced a set of leaflets with some extra tips on ways parents and carers can help their children outside of school. There are already 3 leaflets for literacy and we have just added 3 for numeracy! 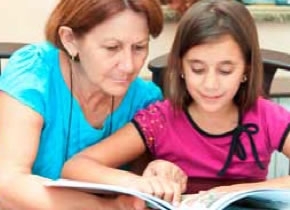 These short leaflets can be kept at home or stuck on the wall and are packed with advice and ideas of ways to practise reading or number skills. You can download them from your user account on the Catch Up® website (just go to the ‘Resources’ tab, then choose the ‘Parent/carer info’ tab) and share them with parents/carers. The files are designed to be printed double-sided and then folded to make handy A5 leaflets, or you can email them to interested parents. Helping your child with number – NEW! Enjoying numbers around you – NEW! Playing number games with your child – NEW! We hope you find the leaflets useful. Download and start sharing them now!